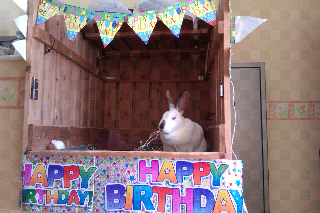 Speedy the cheeky house bunny: Speedy's 1st Birthday party and you're all invited! Speedy's 1st Birthday party and you're all invited! I had a great start to my Birthday,Mummy came and got me early this morning for an extra long cuddle then she gave me some treats.After an early morning nap Mummy woke me up,as she was decorating my pen just for me! Then she let me out to play out side as it has turned out nice while she and Daddy did my lunch,after lunch Mummy and Daddy let me into the kitchen to play and it was already for my Birthday Party with a cake with a candle on it and some presents and a card.Now I'm just waiting for all of you my friends to come and have fun at my party! 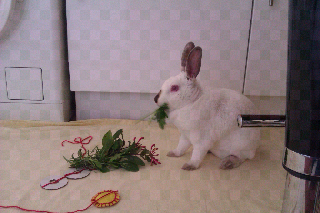 Mum Decorated my Pen just for me! Then Mum decorated the Kitchen just for me! This is me with my Birthday cake and Presents! 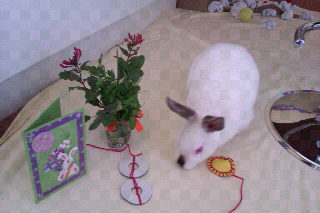 This is me looking at my Decorations! 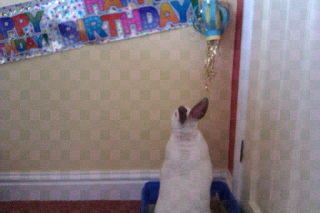 This is my Birthday card that Mum made for me! This is me with my Presents! 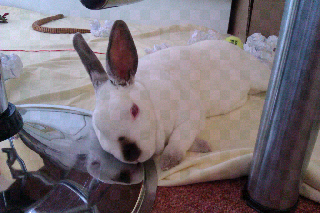 This is me nomming again! OK SPEEDY we are here, all five of us, and we brought you this huge bunch of late season basil from the Farmer's Market. We hope to nom well. Tyler, Sydney, Amelia, Harriet and Daikon. ooh thanks thats really nice,and thank you so much for comming to my party...Heeheehee this is fun! Happy Birthday, Little One. Your Mum and Dad are The Best! I guess you know that already though. Look at all the wonderful things they did for you and for us. This is the best party ever! I sure hope you get an extra long cuddle at bedtime, too. There is really nothing like those extra long cuddles, is there? You're very welcome, Speedy. I'm so glad I could be at your party. You are a very lucky boy to have a Mom who throws you such wonderful parties! Mr. Mick is on his way with a large box of hay cookies, some carrot rum and a roll of his favorite brown paper for shredding and tossing. Happy Birthday, Speedy! Thanks Auntie Jade for letting me know and for letting Mick come to my party...oh he's here...thanks Mick for comming wow is that for me and the party?Thanks ever so much,now the party has really started..hehehe! thank you I'm having such a good time! I send snorgles, cuddles, nose bumps and my own human form of a binky!!!! What a fun day for you, Speedy! You are a lucky ducky bunny! Happy, Happy, Happy Birthday Speedy!!! I hope your day was very special because you sure are special! Getting a late start, but Matilda, Gabby, and Yogi are on their way bearing nommies. They are here...oooh thanks for the nommies...come and join the party! HAPPY BIRTHDAY YOU ADORABLE BUNNY!!!!!!!!!!! I love how you are looking at your cards and decorations lol!!!! I know your Mommy spoiled you and that is just as it should be! Happy Birthday and hope you did a lot of "hopping!!" Happy birthday to you! Happy birthday to you! Happy birrrrrrrrrrthhhhday dear Speeeeeeeeedy....Happy Birthday to you! Speedy! What a great pawty! Me has never seen so many bunnies at once! Kozmo thinks yous bunnies are cool. He thought bunnies would be little but boy was he surprised! Great pawty! Oh wow, Speedy, what a great birthday! You look like you had SO much fun!!! What kind of herbs did you get? I LOVE your pen. Wow, my Little Pal is still partying! I have had lots of cuddles even this morning mummy cuddled me before she went to work and when she had to get ready she left me with daddy to carry on cuddling me until breakfast time! That is what they call the good life, Little One. Cuddle on! What are your plans now that you are getting to be such a big boy. Is it time to start thinking about college? a career? Yes, of course. I apologize for my momentary lapse. That is a huge amount of responsibility! What was I thinking? Anyway thanks for all you do. Here in Texas we are going to designate a special day for Speedy Appreciation Day. If you don't have a day that you prefer, we may just make it tomorrow, or the day after tomorrow. Now that we think of all the things you do, and you didn't even mention making Brandi feel better while she's got a chest cold, maybe everyday should be Speedy Day. Ummm, yes, good idea! And you are soooooooo photogenic. Press coverage would always be great. LOVE, your pictures. They cheer me up, too. Over and out, Little Bud. That would be really nice Sir Speedy. She has a job to do at HOR. Happy birthday! I hope you had a fantastic party! What a party! Happy Birthday Speedy. We celebrated here for you! 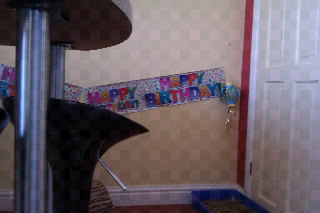 It looks like you had a wonderful birthday Speedy! HAPPY BIRTHDAY! It so happens Mum made carrot cake today and we got to lots of left over fresh carrot! Speedy! Happy birthday!!!! You know it wouldn't be a party if Maddy wasn't fashionably late. Looks like you had so much fun!!!! Love you!!! 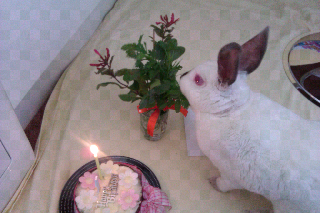 Hoppy birthday!! It looks like you had a wonderful day!! Speedster, I have been very sick with a chest cold these few days past and looking at your cute pictures cheered me up. That and all the brandy I have been drinking. You are SOOOOOO cute, Speedy! Schnuggles to ya! All these pictures are just so wonderful, from memory lane to the party, just wonderful. I will never get tired of looking at them. Wonderful pictures Speedy and Happy Birthday! Speedy! Stop by my blog and picks up your award!! I'm vaguely alive here in Chilliwack! :) I spent Thanksgiving with the parents and came home with a head cold.. And as Maddy's Mum pointed out.. Speedy pictures DO so make one feel better! 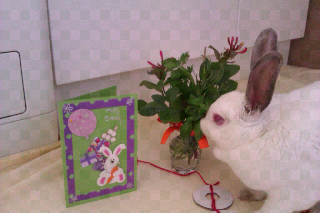 Auntie Lorna feel better soon,I had a great birthday thanks.lots of speedy snuggles to you...xxxxx.Speedy! We hope you had a great birthday and hope we can be new friends! 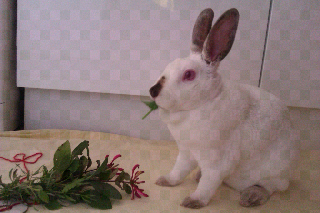 Wow Speedy you're one lucky bunny! We'd love to come over and party. Actually our founder Christine celebrated her 44th birthday on October 9th and her dog, our sister Ma Cherie celebrated her 12th birthday. They are old but we love them. You are libra so you are very special! HAPPY BIRTHDAY!